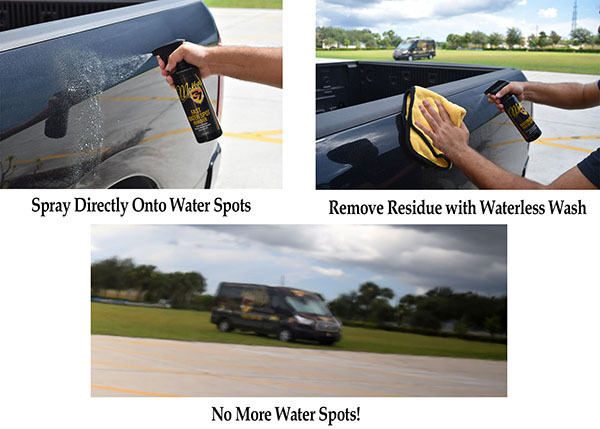 Rid your vehicle of water spots the fast and easy way! The McKee's 37 FAST Water Spot Removal Kit has everything you need to rid your vehicle of unsightly watermarks before they cause permanent damage. This all inclusive kit helps you eliminate surface-level water spots before they etch through clear coat. Start by removing the spots with McKee's 37 FAST Water Spot Remover, wipe it away with McKee's 37 Waterless Wash on the Go, then revitalize the existing protection using McKee's 37 FAST Wax. The McKee's 37 FAST Water Spot Removal Kit even includes a few soft microfiber towels to get you started. Water spots can crop up anytime, and if left on the surface they'll wreak havoc on clear coats. This all inclusive kit is a must have for all car owners! McKee's 37 FAST Water Spot Remover solves an issue that plagues everyone with a car – water spots! It happens to us all: your vehicle is violently attacked by a sprinkler, leaving behind unsightly water spots that will cause permanent damage if not properly removed. McKee's 37 FAST Water Spot Remover breaks up and dissolves the calcium and mineral deposits that are responsible for creating unsightly water spots. How does it work? GREAT! How does it smell? Like orange soda! FAST Water Spot Remover should be on everyone's detailing shelf. Application is as simple as spraying on and wiping off! Total retail value of $64.94, you save $24.95!